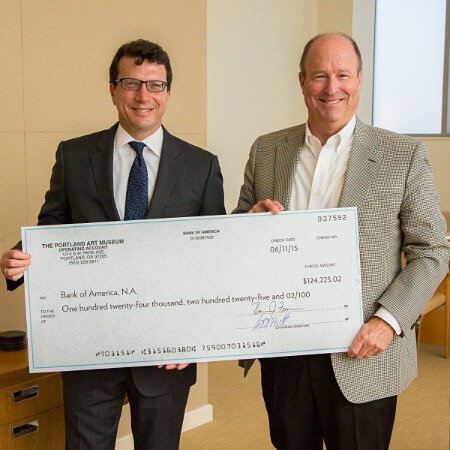 Portland Art Museum Director Brian Ferrriso hands final check to Roger Hinshaw, State President of Bank of America for Oregon and Southwest Washington. The Portland Art Museum entered a new era of financial health Thursday as the institution paid off a major debt that has been on the balance sheet for more than 10 years. The loan started as a way to pay for the remodeling of the Mark Building, including the Jubitz Center for Modern and Contemporary Art, the Kridel and Fields Ballrooms, and the administrative offices for Museum staff back in 2004. The staff and Trustees of the Museum worked closely with financiers, and through making accelerated payments whenever possible and closely monitoring operating budgets, the outstanding loans have been paid. Longtime Museum Trustee Roger Hinshaw was instrumental to the debt reckoning. His background in financial services and his tenure with Bank of America helped to facilitate the money management necessary to keep the Museum’s programs vibrant during the lean years. Now that this milestone has been met, the Museum will be able to devote its energies and resources into providing programs and exhibitions that are accessible to all. The Portland Art Museum has a longstanding relationship with Bank of America. In 2008, Bank of America made a very generous lead $600,000 endowment gift to support free access for all school tours at the Portland Art Museum. Thanks to this gift and to the other donors who joined with Bank of America, more than 1,000 schools and 30,000 students visit the museum for free on a yearly basis. In addition, Bank of America participates in Museums on Us, which provides free access to Bank of America credit card holders over the first full weekend of every month at Portland Art Museum.